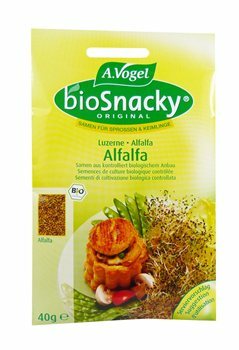 Alfalfa sprouts are considered one of the most nutritionally concentrated sprouts, containing high levels of protein, calcium, carotene, iron, magnesium, chlorophyll, potassium, zinc and other minerals.With BioSnacky seeds it is easy to grow crisp, fresh sprouts on a daily basis. Alfalfa sprouts complement light meals at any time of the year. The slightly bitter, mildly nutty taste gives a distinctive flavour to salads, soups, dips and many other dishes. Alfalfa sprouts are an excellent source of vital nutrients and contribute to healthy, balanced nutrition. These seeds are fab but as a newbie to sprouting I was a little confused by the instructions on the packet. In the end I put the contents of one whole pack in one tier of my germinator. This was a mistake - probably a heaped teaspoon's worth of seeds (approx. 1/8-1/4 of the pack) would be plenty. In the end it didn't matter that I'd put too many in as once some of the seeds had sprouted I removed them to be eaten and most of the rest of the seeds remained in the tier. I continued rinsing these remaining seeds as before and they too sprouted and were ready in a few days (and did the same for the next few batches!). Note to self - use fewer seeds next time!